in other words, in bar format. because we wisconsin folk love our bars! on wednesday night, we are having an end of the semester get together for work, and i’m on dessert duty. i came across a recipe on pinterest that led me to a website called brandy’s baking, where i found the sugar cookie bar recipe. the batter tasted delicious; the frosting tasted delicious. here’s hoping the bars taste delicious! we’ll see on wednesday. 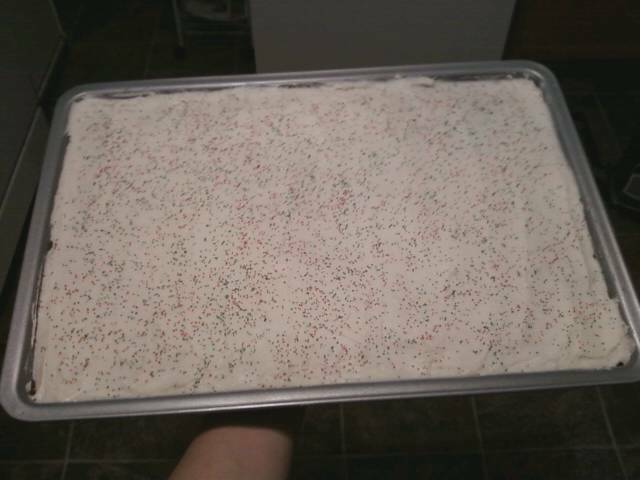 with red and green sprinkles for christmas! This entry was posted in Baking and tagged baking, bars, christmas, sugar cookie. Bookmark the permalink.